The SalesAutopilot user interface has four main parts: header, tree-menu on the left, main screen, footer. 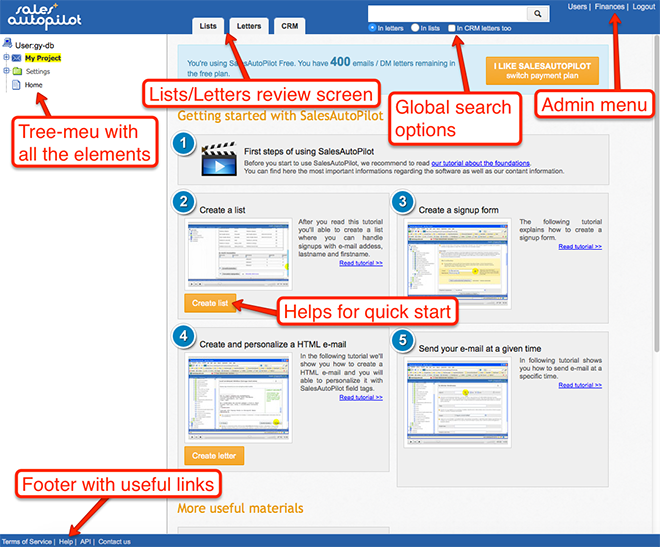 Header: in the header you can find two main tabs for displaying all your lists and letters. There is a global search tool with two options: with the "In letters" you can search in every letter’s content (email, SMS, DM) and subject lines. With the "In lists" option you can search in all lists for email, first name, last name or company name. If you want to search in all fields in all lists check the "In all fields" option, but note that this could be a little slower. On the top right corner of the header you can find links to administrative functions and logout. Left tree-menu: from this tree-menu you can reach all the components of your online automation system. In the "Settings" folder you can find all the general settings of the system. Main screen: this is the working area of the software, this is where you can see your subscribers, setup emails, list and check the results of your activity. Footer: you can find some useful links in the footer. You can reach the knowledge base from there, if you want to reach our support team click on the "Contact us" button.